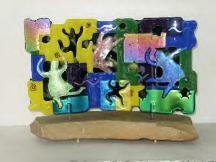 Beginning Glass fusing classes are in two part sessions. The first session the student will learn the basics of how to fuse glass, about System 96 glass and the compatability of fusing glass. 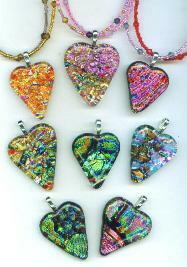 They’ll learn about kilns, firing schedules, frit, stringer and noodles and how that all applies to glass fusing. Then, they will create a project for fusing. During the week those projects will be fired. The second session we’ll discuss the projects, what worked, what didn’t and then plan a second project. We’ll also go a little further into the details of the firing schedules and kiln prep. The projects from the second session can be picked up during the week as they are fired. You will receive a packet that includes information on the new, affordable HotStart kiln from Skutt kilns, System 96 fusible glass, a firing schedule and several patterns that you may use for your projects in class. Frit, stingers and noodles and various other supplies will be provided by Creative Glass. You will need to bring some supplies from home and a glass cutter and breaking pliers are required. Other items will be listed in your packet or you can view the patterns in your packet and a complete list by visiting the fusing patterns page. Class tuition is $45.00. In addition, you’ll need to purchase System 96 glass for your projects. Due to class size limitation, class tuition is non-refundable or transferrable. Students need basic cutting skills to attend this class. For an additonal $10 we offer a crash course on glass cutting. It’s a 15 minute session, 1/2 hour prior to class, where you will be taught the basics of cutting glass. Your teacher will help you pick a project suitable for your cutting level. For a current class schedule, click on “class schedule” from the sidebar. Class size is limited. Tuition is non-refunable or transferrable and you must be able to attend both sessions. 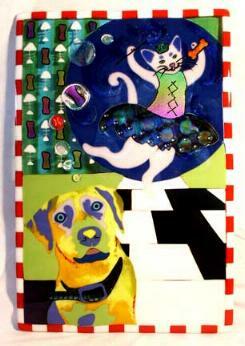 In this class you will create a slumped project like the projects you see above by Carmen Reynolds & Lisa Vogt. You will design your own bowl or plate, create it in class and then we will fire it, then slump it into the shape you have chosen. We have several molds to choose from. This is a very exciting, creative class and requires that you have taken the beginning fusing class or have prior fusing experience. Tuition is $45.00, is one session and includes the two firings of your project required for completing a slumping project. We’ll be posting pictures from these classes soon! Come in and check them out. To find out when the next slumping class is visit our Class Schedule page. Class size is limited to 10. Due to class size limitation, class tuition is non-refundable or transferrable. You may sign-up online for any of these classes by visiting our online, secure store or come in and sign-up in the store. Your space in class is secured with your paid tuition. Class size is limited so don’t delay! Due to class size limitation, all class tuition is non-refundable or transferrable. You may view the beginning fusing class patterns and see a list of supplies for class by clicking on “fusing patterns” on the sidebar. Finally……..the most requested class is now being offered! This class is offered in two sessions. The first session you will create a pendant, a pin and a set of earrings using System96 fusible glass and System96 dichroic glass. These pieces will be fired overnight and you will return the next day and learn how to apply the findings and wire wrapping techniques. Tuition for this two day course is $125.00. All glass and supplies are included to complete three pieces! If you’d like to complete more pieces or different projects, you may purchase additional glass and supplies. This class will be strictly limited to 10 students in order to fire all projects in one firing so that we can finish them the next day. Sign-Up today! Call 872.8889 or email us for class availability. You may sign-up online for this class by visiting our online, secure store or come in and sign-up in the store. We carry a large supply of jewelry findings and tools at Creative Glass Carvings and as in all our classes, any related items purchased during these classes will receive a 10% discount. Add your email address to our “E-News” list and receive periodic art glass news and special announcements. . . We’ll make it worth your while…We do not share you email address and your address will not show to anyone on the list. We respect your privacy.